Melville begins his second season with Long Island and 11th in professional baseball. He first joined the Ducks at the beginning of the 2017 season. He made nine starts with the club, posting a 3-4 record with a 3.45 ERA, one complete game, and 48 strikeouts to just 18 walks over 47 innings of work. 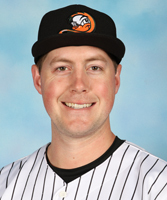 His signature performance came on June 7th at New Britain when he tossed six scoreless innings and struck out 14 batters, tying the franchise’s single-game strikeouts record.